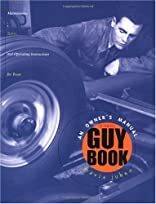 With such chapter headings as "Under the Hood," "Yielding the Right of Way: Consent," and "Avoiding Hazardous Conditions: STDs," Mavis Jukes's Guy Book offers friendly, accurate, and up-to-date advice for prepubescent and adolescent boys. Covering a range of topics, from masturbation to decoding girls' signals to making that earth-shattering choice between boxers and briefs, this wise collection of information and how-tos will appeal to the testosterone-ridden boy who would sooner die than ask his mom or one of his buddies about spontaneous erections or confusing emotions. On the other hand, Jukes encourages readers throughout to talk to friends and caring, responsible adults, and offers guy-appropriate lingo and tips to help facilitate tough situations. On breaking up with a girl: "Breaking up on a Saturday afternoon at your soon-to-be-ex's house (where support is available) would be better than springing it on a Monday morning at school." Humorous, ironic 50s-style illustrations feature pistons (accompanying male anatomy discussions), engines, and clean-cut boys and girls in big old cars.